Then, the thread is passed to the back side and pulled upwards. You see, from the next picture, that there is a little bare thread appearing between each tds, so we have a very small picot every each tds that plays hide-and-seek. 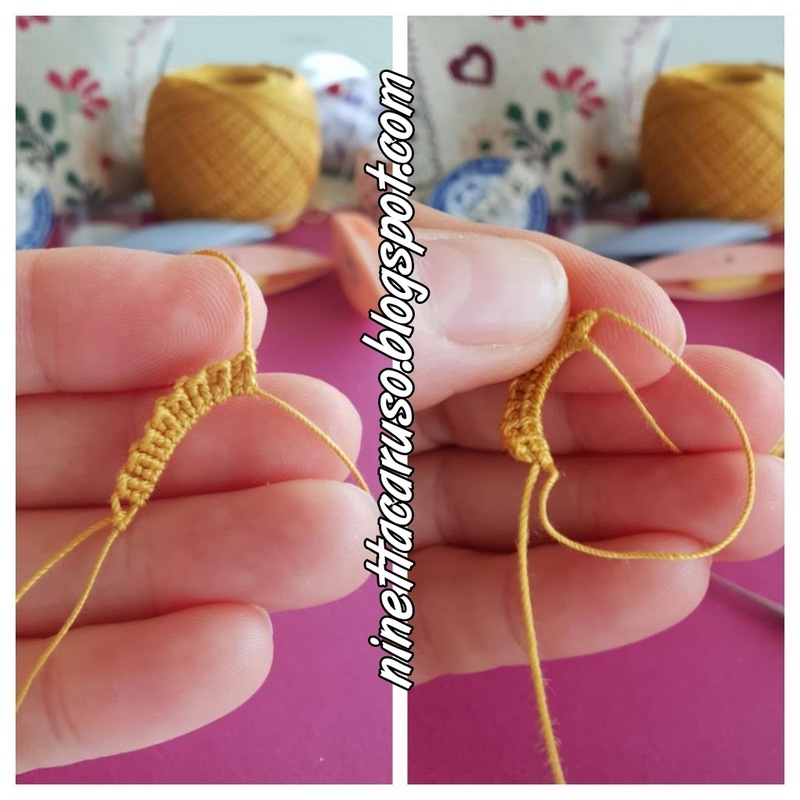 I will call it the "hidden picot". Pull the thread toward the hidden picot between the fourth and the fifth tds. Then block the spiral in position with a lock join. (*) The number of tds can vary, of course, it depends on the pattern. 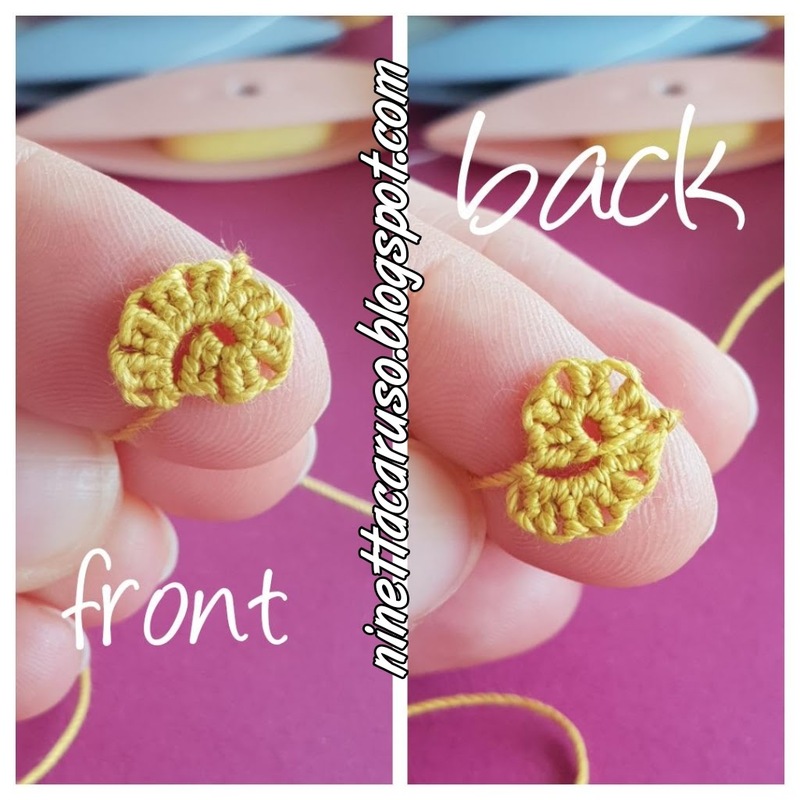 (**) The spiral can be oriented in the opposite direction, just don't insert the shuttle inside of the loop, from front to back, before closing the ring. Depending on the pattern, any of the "hidden picots" can be used to block the spiral in position. 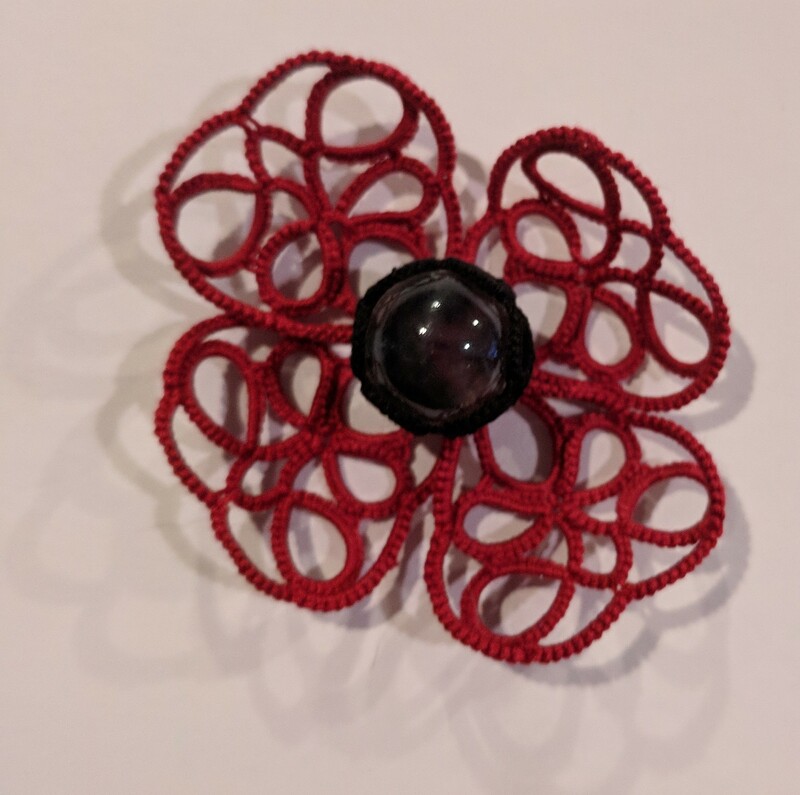 Beads can be added, too. I didn't took any picture, though. I tried another version, combining ds and tds in the same spiral ring. 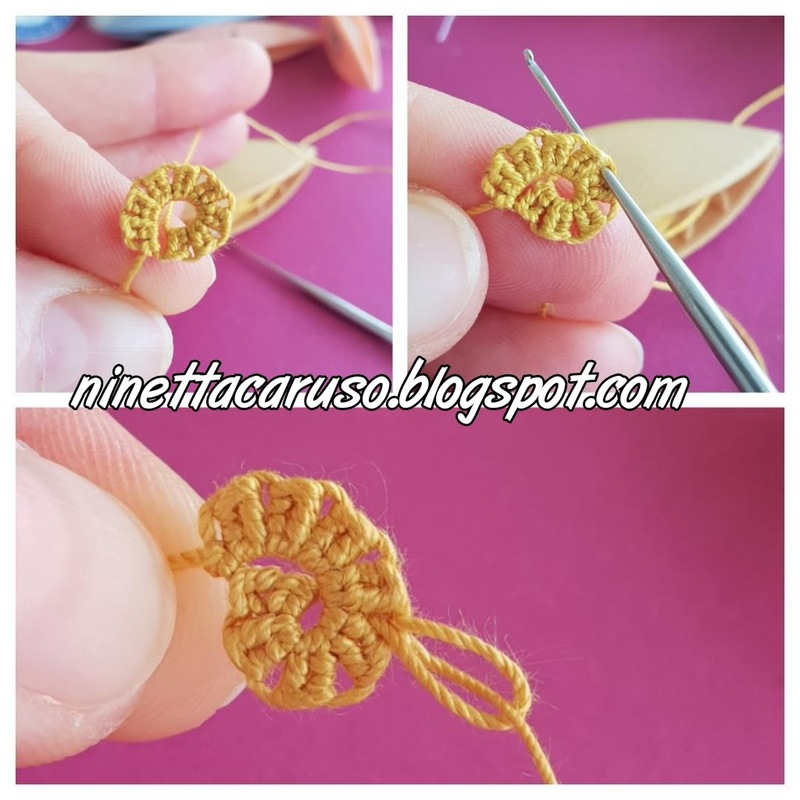 In previous picture, I started with 13 picots separated by 1 normal ds each, then I tatted one last tds, posted the shuttle inside the loop and blocked the spiral, locking the thread in the 7th picot. The height of the picots and the last tds make the spiral look like previous all-tds spiral, but tatting this one is way too faster than tatting all tds! 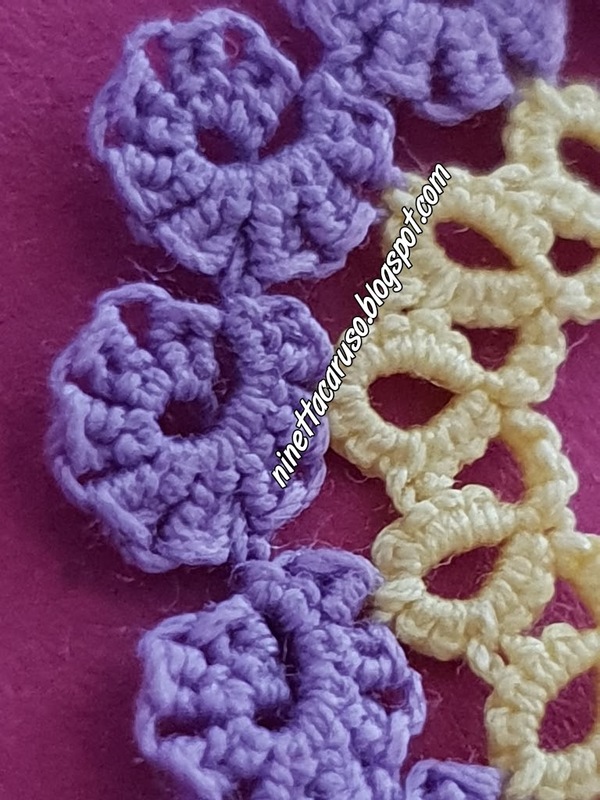 In that motif, the "hidden picot" is between the third and the fourth tds. 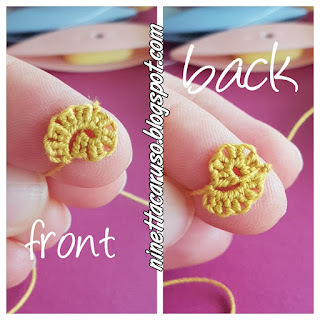 I'm planning to share the pattern, starting from next week. I hope that someone of you wish to tat-along with me and I really hope to have any feedback, too. If you like, you can start now, as the pattern starts with a lanyard of spiral rings. Actually, there are 14 spiral rings. 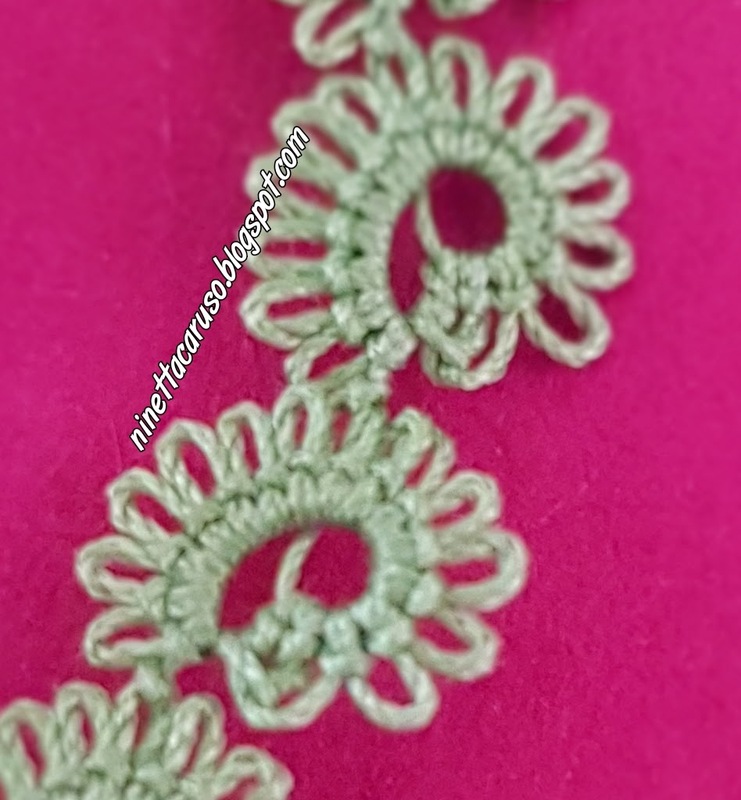 At least, if not my motif, with 2 detached set of 2 or 3 spirals, you will have a new pair of earrings 🙇 ! 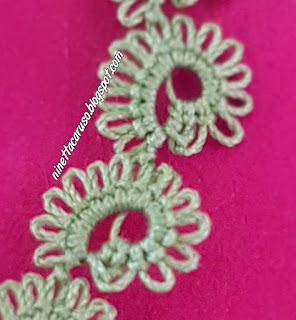 I admit... that tds aren't fast tatting, definitely. It is just like when we did the very first "flip", tricky at first but so addictive. Me too, I need more exercise. 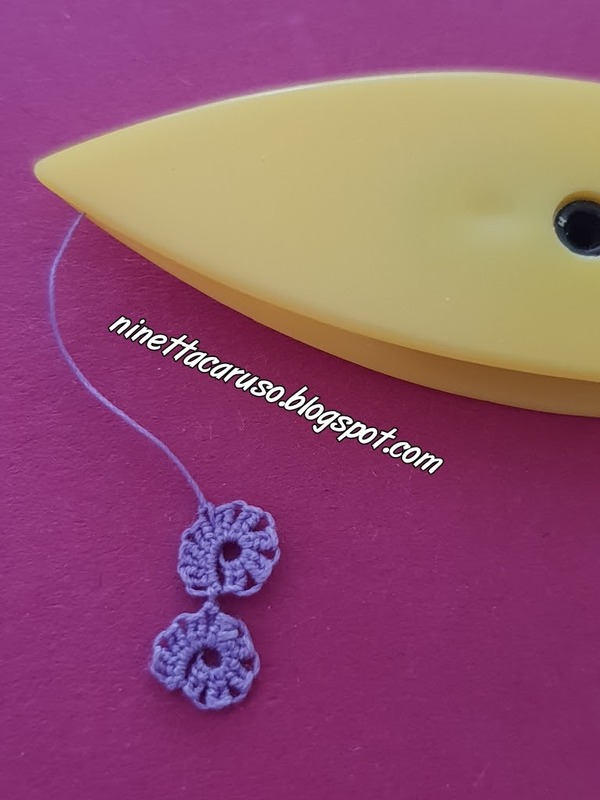 Maybe, you didn't know that "ciao" it's used in place of both "hello" and "bye" and I've learnt that we've used this word in the current way only for a couple of centuries, from the early nineteenth century, so it seems it is just as old as tatting 😍. 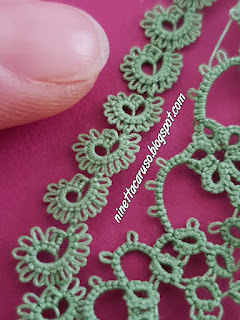 So many possibilities Ninetta, I like the combination of the Lenka ring and the treble tatting. I want to do this and really master the trebles. Mine don't quite look like yours. It's good for me to try new, it reminds me of how learning this can be tough (I learned -gasp- forty years ago....) ciao! (I love listening to Italians saying ciao on the phone, the most I ever heard one person say it for a closing to a call was SEVEN times! Nice experimentation with effects !!! Oh, and what will you name the motif ? What about "butterflies' swirl in treble tatting"? I can't translate "girandolina" :(( sigh! sigh! And it could be Swirling Butterflies in English?